This post is the start of a one month challenge to double my web traffic using Facebook advertising. Over the past 2 months I’ve generated a total of 4,201 visits to my site. That’s an average of 71 visits per day, which suggests I’ll achieve 2,136 visits during April. If I double my traffic I’ll achieve 4,272 visits. Being that I have a base-line of traffic I’ll need to generate around 2,100 visits from advertising. How much would I need to spend? Well, over the past 3 months the Facebook ads I’ve run for my other businesses have achieved an average click-through rate of 2.4%. That means I’ll need to generate 87,500 ad impressions to generate 2,100 clicks. My last 10 ads have cost me $.41 per post engagement but post engagement includes likes and comments, neither of which is traffic to my website. My job for tomorrow, then, is to estimate how much I’ll need to spend to generate 87,500 ad impressions. The following infographic from MoonToast shows how data flows through Facebook. What’s especially helpful is how the different types of fan engagement work to surface page content. Presented by Emily White, Senior Director Local, Facebook. Real estate agents are the original social networkers. Facebook just takes that online. Local is social. We find out about what’s going on in our community through social. People want to go to great places. Local is conversational. Businesses are affected by recommendations through local conversations. Find a way to continue offline relationships online. Discovery is happening both on and off-line. When someone sees that a friend is at a restaurant they’re more likely to do business with that place. Word-of-mouth at scale. It’s WoM magnified through an online network. Deals that are shared with friends are three times more likely to be taken up. Create a page. Keep it interesting. Connect the virtual and physical. Put your website and Facebook page on your card. Engage with fans. Welcome them. Think about Facebook as a party. That takes effort. Keep them updated. Engage with them. Acquire new fans. 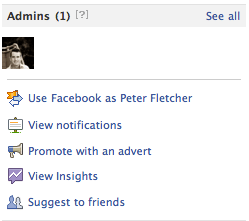 Give people the option to Like your page quickly. Get them back to your store. Take something that’s action oriented and ask your fans to do something. Research shows that Facebook fans want latest news, contests, discounts. Facebook has found a sweet spot at around 3 updates per week. The best place to promote a fan page is through a Facebook personal profile. It’s a place where you can transition people to a place where they can read real estate related information. People focus too much on customizing their page and not enough on creating content. Use Facebook advertising to build your fan numbers. Use a QR code as the ad image. When people use the QR code you don’t pay for a click. Customizations are wasted when people view the page on a mobile device. Don’t post more than once per day. It takes away comments on Likes on other posts and knocks them out of Top News. Tweet as much as you want. Facebook has just released the Send button. It’s designed for people who want to share a page privately or with selected friends in a group. Whereas clicking the Like button sends a notification to all friends’ news-feeds, the Send button is a social plugin that allows people to share and comment on a web page via via email, Facebook Messages, or to a Facebook group. Although it’s designed to sit alongside the current Like button a standalone version is also available. The button has the potential to increase quality web traffic by allowing visitors to send a link to their friends that’s relevant to their needs and interests. Improving the quality of traffic typically leads to more leads and higher conversion rates. 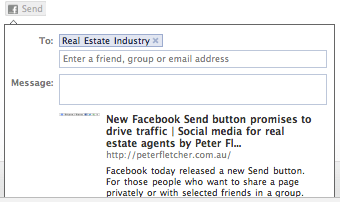 There’s no need to copy and paste a URL and no need to look up email addresses as friends auto-populate within the sharing dialogue box. If you found this article helpful use the Send button above to share this article with some of your friends.